Chinese New Year is approaching, I am warming my engine up making some favourite CNY cakes, biscuits, dumplings and not forgetting a meal on CNY eve. My first CNY related recipe this year is Lo Mai chee. 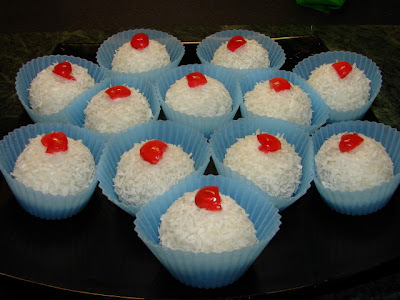 Lo Mai Chee 糯米糍 is Cantonese style mochi, some people called lo mai chee as snow balls. Anyone who does not know what a lo mai chee or mochi is, it's a soft and chewy dough ball normally filled with a sweet paste or filling. This is a favourite snack for CNY because it is sweet and sticky, to symbolise a sweet and close family or relationship. Authentic Japanese mochi is really hard work to make which sticky rice is steamed then pounded with a large wooden stick, usually men's job for pounding the rice dough and the cakes are only made for special occasions. You may find some Japanese mochi mixing green tea powder into the dough. Cantonese lo mai chee and some some short cut Japanese mochi are made with glutinous rice flour or sweet flour. Here are some lo mai chee I've made with a red bean (aduki bean) sweet paste. I love them they are sweet to look at and I like the soft and chewy texture. I don't put too much sugar in the dough so not too sweet. You may come across some messy recipes of which the dough is steamed till cooked which makes it very sticky and messy to deal with, then it is divided and filled. I find this too messy and hard work. This recipe I am showing you is far easier. I have added wheat starch to the recipe, so the dough is firmer and less sticky to the teeth. This dough recipe is very versatile, can be steamed like this recipe, pan fried or deep fried to make various other sweet and savoury dim sum/cake. I will show you some other recipes in later posts. For fillings you can use sweetened red bean paste, lotus seed paste, ground peanut with sesame etc. If you like a east meets west combination, you can use chocolate for the filling. I have also seen people using chocolate coated strawberry as filling, perfect dessert to celebrate both Valentine's and CNY together. So be creative if you like. For the coating, you may use dessicated coconut, roasted sesame seeds and toasted glutinous /soy flour. Here is the classic Cantonese Lo mai chee with red bean paste 豆沙糯米糍 recipe. * I normally make double portion of this dough and use the other half for another recipe. Put wheat starch in a medium large mixing bowl. Pour in the boiling water. Give it a good stir till you cannot see dry flour. Can be a bit lumpy but that is ok. Leave to cool for couple of minutes. Add in the glutinous rice flour, sugar and oil. Start to add water, put about 1/2 of the cold water first give it a good stir with a spoon, then add 1 tbsp of water one at a time and start mixing with your hand. You may need just 1/3 cup in total or a bit more. What you need to look for is the all the dry flour is thoroughly mixed and the dough is not sticky to your hand. Mix by squeezing and kneading the dough till very smooth. Leave to rest for about 15 minutes. For the sweet bean paste, take about 2 tsp spoon each (about 15g) and roll into a ball. Make about 12 balls. Normally bean paste is very thick and can be shaped, if you get a very sticky soft bean paste, forget about rolling into balls just scope a small dollop when wrapping into the dough. Wash you hands after handling the bean paste before you touch the dough or you will end up staining the dough. Also make sure you clean the work area. Take the dough out and roll into a uniform long sausage about 35 - 40cm long. Divide equally into half, then half again into 4, finally cut each quarters into 3 pieces. Each piece of dough is about 28 - 30g. Roll the dough into a round ball. Flatten each ball and spread it out as shown in the slideshow below. Try to make the inside thickness thicken than the edge. Put the bean paste ball on (or scoop some on) then wrap it up. Smooth the surface and roll between palms to a round ball. After making one ball make sure you wipe the thumb or fingers that has touched the bean paste to avoid staining the next ball. Line a steamer with parchment paper (which has been pricked to allow steam to pass through). At the meantime preheat the steamer. Put the balls on the steamer and steam for about 8 - 9 minute on high heat. 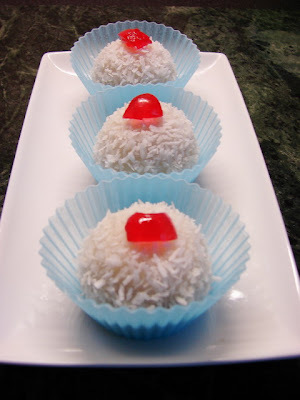 Just before the balls are cooked, put some dessicated coconut in a bowl and get ready a cup/bowl filled with some water. When the balls are cooked and still steaming hot, wet hand and scoop balls straight out of steamer and roll with coconut. Then put the balls on paper/silicone cupcake cases. If you use paper cases, wait till the balls are cooled before you put on the paper, if not steam/heat from the ball will flatten the cupcake case shape. If you like you can top each ball with a small piece of glace cherry. Serve warm or at room temperature. Best eaten on the day. If you leave them for too long at room temperature or in the fridge they will harden up. Can refresh using the microwave for 10 - 15 seconds. Excellent. I'm making but jai goh (those rice steamed cupcake things) at the weekend and I wondered what to do with the rest of my (bought) bean paste - this looks just the ticket. Hi Lizzie, put zai goh is better with freshly boiled aduki beans though. My Jah-Por (外婆) used to make these. She made them the steamed sticky paste way and would roast peanuts in the oven, skin them then grind them to make a roast peanut, coconut and sugar filling. They were plain on outside not coconut covered. She used to make them to sell many years ago and my Jah-Goong (外公) would make egg tarts (蛋撻) to sell as well. He could also make wife cakes (老婆餅) and sponge cakes sandwiched with buttercream and cut into triangles - like a sandwich (海綿蛋糕). He'd probably be impressed with chiffon cakes that are popular today, but sadly, he's not around anymore. You are really lucky to have such grandparents that can make good cakes and biscuits.